Dubai, UAE, March 31, 2019: We are living in a world of contradictions. In our constantly connected lives, we sometimes find ourselves dreaming of simpler times even as we appreciate the convenience of modern technology. If only we could have one foot in the past and one in the present. Future-focused Swiss watchmaker Rado proves that we can have it all by combining the brand’s illustrious past with its pioneering present for a watch that is designed to look good now – and in the future. This is the new Captain Cook Automatic Limited Edition. hard-wearing leather travel pouch with a selection of additional straps. If the brown vintage-look leather strap isn’t what you’re looking for today, simply exchange it for the fine knit stainless steel Milanese bracelet or the durable NATO strap. The 37 mm stainless steel case is exactly the same size as the original. There are three seahorses stamped on the stainless steel case back, just as on the original 1960s models. The diver’s style turning bezel, the date in red and the distinctive sword and arrow-shaped hands are some of the best-loved original Captain Cook features. They’re all present and correct in 2019. Modern materials updates include the high-tech ceramic insert for the bezel for added scratch resistance and the sapphire crystal that offers optimum dial protection. The modern automatic movement also offers up to 80 hours of power reserve – a feat unimaginable in 1962. With its subtle colour scheme, the Captain Cook Automatic can blend seamlessly into any situation. Its 37 mm case won’t stand out but it definitely makes a statement about the wearer. 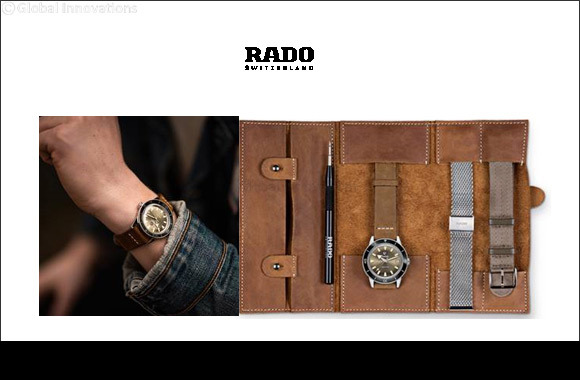 Rado Captain Cook Automatic is a perfect vintage look for modern time travellers.